Our goal is to provide children with a hot lunch that is high in nutrition and calorie content while teaching self sustaining gardening and putting those skills into practice in a school and community garden. Outside of Santo Domingo, the capitol of the Dominican Republic, lies Batey Fao. The village is a shanty-town, made up of tin shacks and inhabited by Haitians from the other side of the island. It lies under a set of high power lines. The Haitians are mostly illegals, having come over from Haiti to work in the sugar cane plantations that used to be owned by the Dominican government. The plantations were later privatized, and the new owners fired the Haitians and replaced them with Dominicans. The Haitian people, often living as squatters, are now day laborers, hustling to get work wherever they can find it. In a good day, they might make the equivalent of two American dollars. The conditions in Haiti are so much more horrific, however, that the Haitians remain in the Dominican as they seek to make new lives for their families. In the batey, there is a Christian school named the Jerico School. 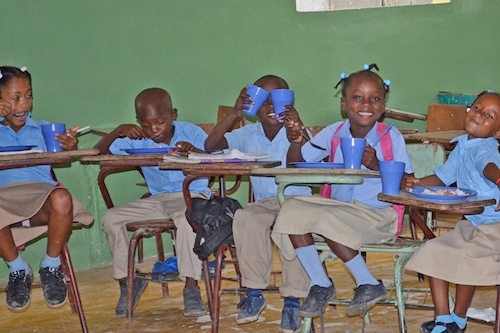 This school has grades one through six, and its students are mostly Haitian children. Many families struggle to make the tuition payments, even at ten dollars a month. The parents see the Jerico School as a hoped-for “ticket out” of the batey for their children. In the school, the children learn Christian values, learn to read and write, learn arithmetic, geography, and other subjects. If they can make it through the eighth grade (at a school down the road in Guerra), and better yet high school, they have a real chance to earn Dominican citizenship, thus opening the doors to employment, health care, and a new life. Students at Jerico School wear uniforms, and often siblings go to school half a day, then return home to their shack and give up their uniform to their sibling so he or she can attend the other half of the day. There is typically little or no food in the home for a mid-day meal. Mika’s Lunch is named after a little girl named Mika, whom many of us have met on visits to Batey Fao while there on building projects. Mika is from a family that has little but even so has a great faith that the Lord will provide.